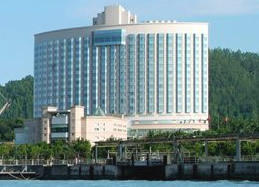 Nansha Grand Hotel was built according to five-star international standards. The hotel is located in the beautiful Guangzhou Nansha Seashore Garden City, facing the grand LingDing Pacific, in the north of Puzhou Moutain, close to Nansha Golf Court. With predominant location and convenient transportation, Nansha Grand Hotel is ideal for both travel and business. The hotel boasts 320 luxurious guest rooms, arranged on 5-15 floors. Many types are vailable: superior room, deluxe room, superior suite, deluxe suite, executive suite, executive deluxe suite and so on. All rooms are equipped with air-conditioning, IDD, DDD, satellite TV, min bar, refrigerator, broadband internet access, safe box, etc.